You or your loved one are diagnosed with breast cancer. You’re in a state of shock and disbelief. At some point word gets out and family, friends and acquaintances start coming out of the woodwork. People offer advice. People start offering to bring food. You don’t even know what you need. You often feel so overwhelmed you just say a polite “We are fine, thanks!” But, the truth is, you probably could use some help and support. Maybe not after the first treatment, but by treatment three or four, dinner for the family, walking the dog, or someone to do a load of laundry could be nice. That is where MoreThanFriends comes in to help. MoreThanFriends is a partnership between Komen Central Indiana and WhatFriendsDo, and allows survivors and co-survivors to create a personal webpage to keep people updated (No more texting the same information over and over and updates don’t get lost like on Facebook.) as well as a calendar to organize help that is WANTED and NEEDED. 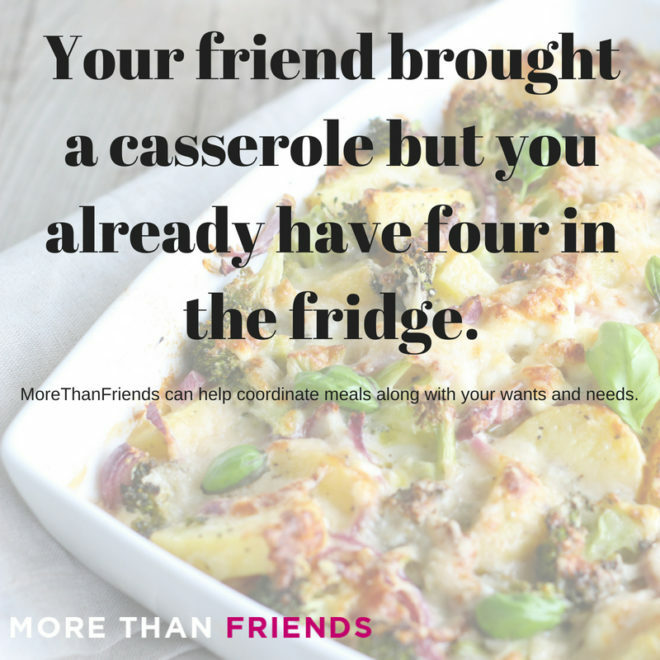 MoreThanFriends is your place to organize all the help you need in a manner you truly need. We offer a wishlist though Amazon, a place to leave notes of encouragement, a donations feature and much more. Trust us, you don’t need another casserole. Visit, https://komencentralindianafriends.org/ to get started.